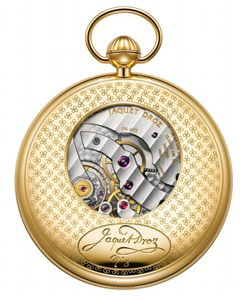 Jaquet Droz Pocket Watch Pocket Watch Ivory Enamel.There are many people today are not able to resist him again. There are many people today are not able to resist him again. In fact the ‘pocket watch has never ceased to issue its irresistible charm. Modern man is now again ready to embrace – this time by choice – its mystery. It is the illusion of being able to store the time – this is huge – in a pocket, stroke it with your hand, see and stick only to those who want to show their rounded shapes. 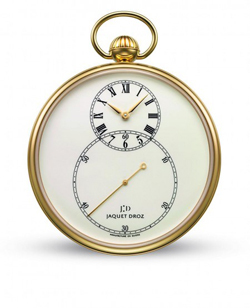 Jaquet Droz Pocket Watch Ivory Enamel is all about. If anyone put in his hands to say you would not know where it comes from and how old he is, maybe because its face is still exactly what “profile” that is named Grande Seconde and the watchmaker Jaquet Droz conceived way back in 1785. Ivory Enamel Pocket Watch is now built to connect a very remote past with our modern times. To do this you need art that, not sure I remember it, is unlike the technology immortal. The slim rounded profile of the yellow gold case leaves dominate the spacious dial Grand Feu enamel in a warm shade of ivory. The back of the case is covered with shamrocks, secret signature of Jaquet Droz, applied with a delicate engraving Guilloche. Engraved by hand are also written Jaquet Droz with individually numbered – as it has always been linked in quantities limited to one or two numbers “8”. By the way, did you know that Abraham-Louis Breguet commissioned just Jaquet Droz to come up with what later became, and still is, his “secret signature” because (in his day) even the genius he was having to fight on a daily basis several counterfeiters who claiming to be true copies of his works? Returning to this pocket watch movement is hand-wound with a power reserve of 40 hours. Pocket Watch Ivory Enamel is a tribute to that Jaquet Droz – witness today his automata – more than a watchmaker was an “enlightened” perfectly “in compliance” with the era in which he lived.